A global prize competition called Sign On For Literacy has awarded five innovators seed funding to develop technology-based solutions that increase access to sign language and improve literacy outcomes among deaf children in "low resource" settings. The winners were selected through a competitive process that drew more than 100 proposals from teams in 39 countries. Each project received $25,000 in seed funding to pilot its efforts during the next stage of the competition. An additional $225,000 in prize money will be made available for the most promising outcomes after that. SignShare, an open-source digital platform developed by Gallaudet University's Visual Language and Visual Learning center, that lets users create and share signed stories and resources uploaded to a digital library. The same platform also provides information, such as tutorials, research on literacy development for deaf children (92 percent of whom are born to hearing families), templates, lesson plans and classroom worksheets. A Sign Language Option for KitKit School, developed by Enuma in partnership with the Center for Early Intervention on Deafness, will add sign language functionality to KitKit School, a tablet-based early learning program that helps kids learn literacy and math skills independently. The project will also create a sign documenting app to help communities in Tanzania and Kenya record and incorporate local sign languages into their school curriculum. Señas de Sentido ("meaningful signs"), undertaken by Manos Unidas and the National Deaf Association of Nicaragua, encompasses three components: an interactive, community-led body of Nicaraguan Sign Language (NSL) signs and their relation to Spanish words; an app for smartphones and tablets designed to simplify learning and use of NSL; and a literacy outreach program focused on children and their families living in rural areas of Nicaragua who lack access to special education. World Around You, developed by the National Technical Institute for the Deaf at the Rochester Institute of Technology in partnership with the Philippine Federation of the Deaf and De La Salle-College of Saint Benilde in Manila, will collect local sign languages and create an open-content digital library of folktales offered in an interactive bilingual format integrating local signed and written languages. These digital libraries will be viewable from any web browser, can be hosted locally on Linux-based computers and mobile devices, and can be remixed by people (including children) with simple text and video editing tools. Studio KSL, to be implemented in Kenya by nonprofit eKitabu, will be a production studio where Kenyan Sign Language (KSL) and its regional differences will be documented. The output will include a visual glossary and KSL videos using deaf actors for integration into accessible books to be distributed across the country. 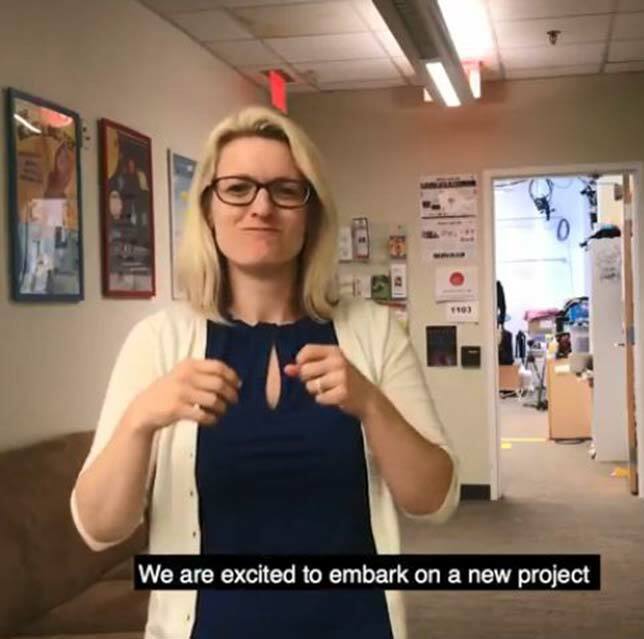 Melissa Malzkuhn, creative director for Gallaudet University's Motion Light Lab, introduces her team's entry, SignShare, in a video produced for the Sign On For Literacy grand challenge. "The innovations sourced through the Sign On For Literacy prize harness the creativity of the global community to develop technology-based solutions that can improve literacy and learning outcomes for the 32 million children around the world who are deaf, hard of hearing or deaf-blind," said Colin Allen, president of the World Federation of the Deaf, in a prepared statement. "Only two percent of these children receive instruction in sign language, severely limiting their access to language and isolating them from society and opportunity over the course of their lives." Deaf education has a "critical gap" in which "millions of deaf children around the world" have no access to literacy, added Deborah Backus, World Vision's acting project director for the challenge initiative. "The innovations sourced by the Sign On For Literacy prize will help fill this gap and ensure that deaf children have access to literacy and education, a fundamental human right." These solutions will undergo two more phases of review and prototype refinement with the potential to win additional funding. The program is being supported by World Federation of the Deaf, the Nyle DiMarco Foundation and Deaf Child Worldwide.